Commercial Pop Rock with Classic rock grit and a touch of the 80's. Camile Barbone (who discovered MADONNA) told lead singer Frank McDonough to quit wall street and form a band. 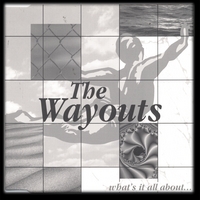 The Wayouts are the result. Playing at the Stone Poney, CBGB's Bitter End, China Club, the band went on to record "the wayouts" - give it up. The band harnesses explosive energy and a positive attitude creating their success as a commercial alternative rock/pop band.